Before attending the All Candy Expo, all the registered press people were sent dozens and dozens of press releases from various companies advertising their products and inviting us to drop by their booths. 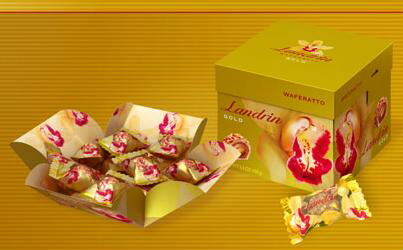 That is where I first heard about Landrin Waferatto USA. The companyâ€™s roots date back to the nineteenth century when Georg Landrin began preparing confections for the Imperial Court of Russia. The reputation of his delicacies spread throughout the country and Europe, earning his products notoriety for their quality ingredients and taste. 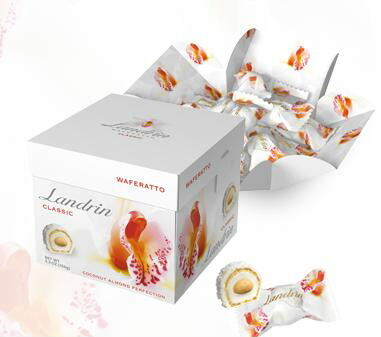 Landrin USA was recently founded with the intent to market a line of truffles with designs and packaging inspired by couture fashion and art – i.e., appealing to women. I remember checking out some of the photos from their press release to discover all their boxes adorned with orchids, chiffon prints, the elegance of a perfume box, and they somehow unfolded into vases when you opened them. Elaborate much? Maybe. But the principal and design is aesthetically sound, which is why itâ€™s a current silver finalist for two of the 2009 Sofi Awards (Specialty Outstanding Food Innovation). But part of me didnâ€™t want to like these. They were too pretty. They were too girly. It was hard to miss the Landrin booth at ACE. I mean, everything was sheer white and all the people staffed were impeccably blonde, skinny, manicuredâ€¦ everything you expect from a person who doesnâ€™t eat anything, much less chocolate. But the Landrin people were super nice and they offered me as many samples as I wanted form their five different assortments. I grabbed a handful of each one planning to give them away, never actually eating any during the showâ€¦ it wasnâ€™t until after the third day when I finally tried one that I realized I had to hoard every piece I took. Experience the delicate taste of white chocolate and shredded coconut with whole California almond and silky cream center in a crisp wafer. Waferatto Classic: There is a strong nut scent to this piece. It resembles the compact shape of a Ferrero Roche as itâ€™s a small, almost spherical truffle dusted in nuts. My first bite easily penetrates all the different layers of the candy. The piece is very creamy, but differs from most coconut candy in being more flavored with coconut milk than actual coconut, which is rather mild in a good way. Thereâ€™s lovely textural contrasts between the almond center, crisp wafers, and smooth white chocolate filling. Everything about this blends harmoniously, yet itâ€™s incredibly light and filling. My favorite of the five. 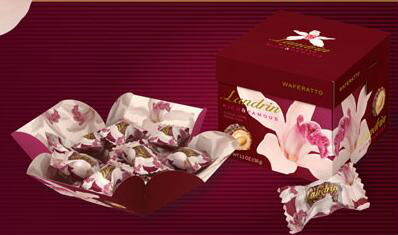 Discover exquisite chocolaty hazelnut filling, embraced in delicate cream, wafer and the finest crushed hazelnuts. Waferatto Gold: Resembles the last piece, which throws me off at first because it has a white outer layer, even though this is a chocolate truffle. Taking a whiff of it, an aromatic fragrance akin to Nutella is revealed. What I enjoyed about this one was how the chocolate center was complex in flavor, but not so rich that it burned. It wasnâ€™t as well composed with different flavors as the last truffle, but it emulated its textures and was pleasant nonetheless. Chocolate and whole almond filling, in a crisp wafer, covered with a milk chocolate glaze and topped with dark chocolate morsels. 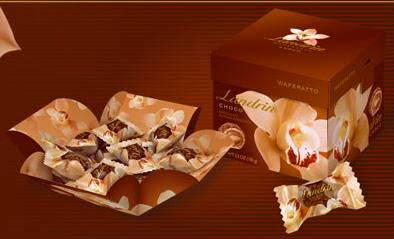 Waferatto Choco: The chocolate mousse flavor is almost alcholic in quality, and the added presence of almond gives it a real amaretto taste. Personally, I donâ€™t think that quality blends well with the chocolate, and these odd fruit notes keep percolating. It’s my least favorite. Chocolaty coffee crÃ¨me with a whole almond, in a milk chocolate covered wafer, topped with chocolate flakes. Waferatto Coffee: The faint smell of coffee grinds emanates from this piece. Now, I am not usually a fan of anything coffee, but I loved these. The coffee is muted in a delicious way, carrying the flavor and notes of coffee, but none of the bitterness or residual tastes. The center isnâ€™t too bold or creamy. Waferatto Rich and Famous: Thereâ€™s a sharp coffee smell to this one. 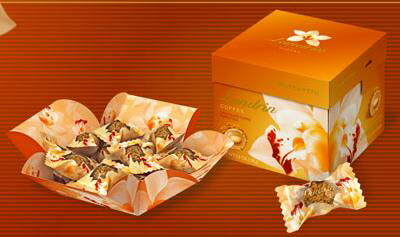 The almond flavor isnâ€™t too prominent, and the crÃ¨me combination is overpowered by the potency of the nibs. These arenâ€™t easy to track down. Though they are stocked in over 5,000 places in the U.S., they are distributed through high-end retailers. If you canâ€™t find them in person, I do recommend you purchase them online. At seven dollars a box, theyâ€™re not egregiously priced, and these are certainly something you should experience. how does the hazelnut one compare to ferrero rocher? I’ve actually noticed these in my local Safeway (Colorado Springs), thought about trying them and then I remembered how often I like chocolate from the floral dept. (almost never) But I guess I’ll have to give them a shot now :) Thanks for the thorough review! I’ve seen them in my Safeway in Oregon (in the flower dept also). They even said that I could use my flower coupons on them!